Thoughts on faith, the great commission and our cobbled together life. A month or so ago I was paging through the beefy book, “A Tale of Three Cities“, a historic survey of Marion, Monroe and Dolton, three small towns in our area of South Dakota. As residents of Marion, it has been engaging to learn a bit about the history of the area, to read of the stories of the earliest settlers, their triumphs and tragedies and the oddities of life that make reading history entertaining. The book itself was produced for Marion’s centennial celebration back in 1979 and is filled with early history, newspaper excerpts and family histories. 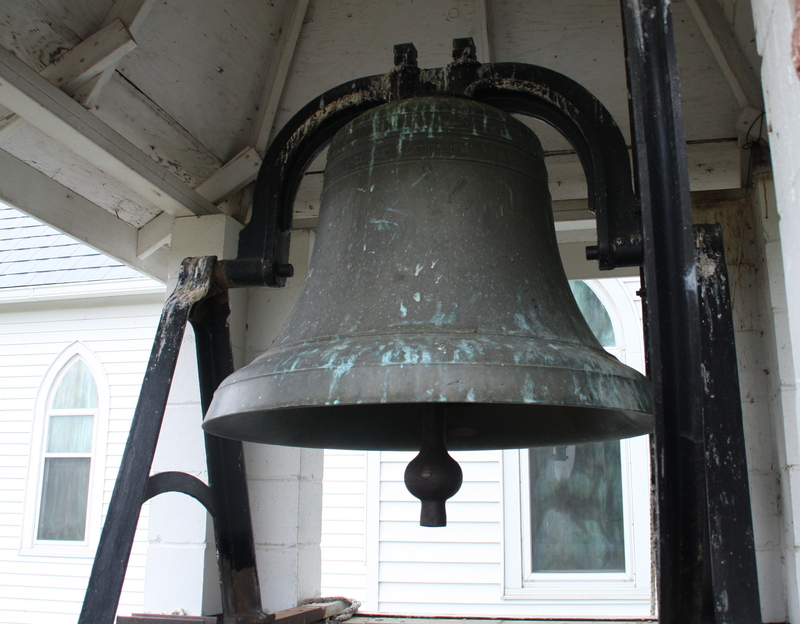 July 1902 – The German Church of Monroe purchased a new bell for their church. The bell is one of the largest in the country and weighs 1,500 pounds. For one reason or another, 1,500 pounds seemed really big. I was imagining an enormous, six foot tall bell that the whole county must have been talking about. And yet, there was nary a word more about this bell or what happened to it. I had stumbled into a mystery. A small secret from history that curiosity demanded I – or rather we – investigate. What had happened to the 1,500 pound bell? I asked around a bit and then, this last Saturday, the kids and I loaded into the van and drove the seven miles out to Monroe to pick around and see what we could find. 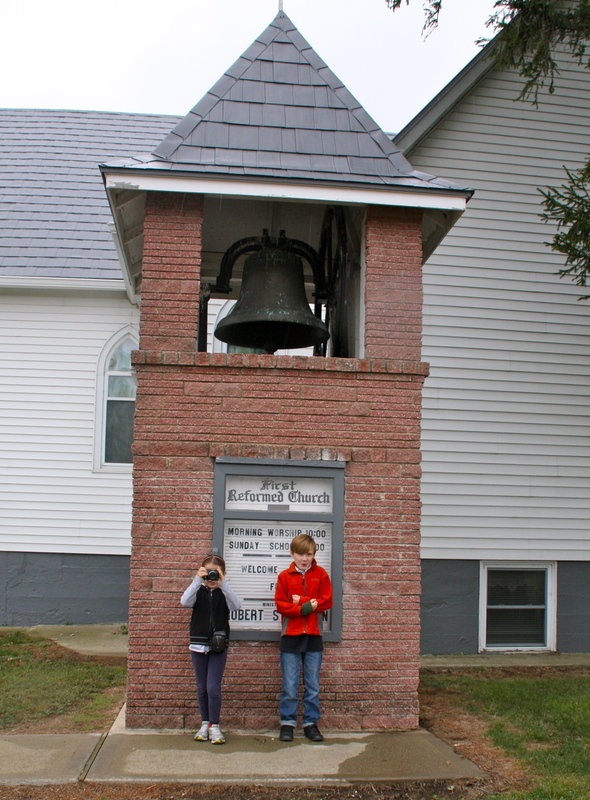 There are two churches in Monroe – both with bells but neither seemed to be a 1,500 pound bell. We wound from one street to another discussing where a church might have been, taking in the quaintness of the town, discovering the lone business – a bar. And then we decided to head back home. Thankfully we pulled into the smaller of the two Reformed churches and noticed the sign on the outside of the building. 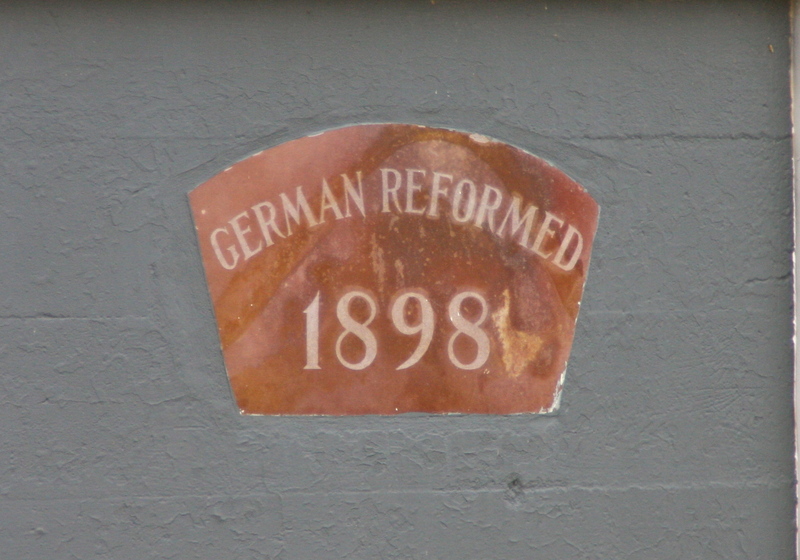 It read: German Reformed – 1898. Perhaps we were on to something. We got out of the church to take a closer look at the bell, conveniently hung on an eight foot tall stand alone bell tower in front of the church. In front of the bell tower. Sonora – our budding journalist has here camera ready. I had assumed all along that this bell would be grand, giant, larger than a normal church bell. As we shoved Malachi up onto the ledge he read the inscriptions on the bell. On the back side: E.W. Vanduzen Co.
On the front side: Buckeye Bell Foundry – 1902. A bit fuzzy but there’s the date – 1902. We had found the bell. We returned home to do some google searching only to find that it doesn’t take much bell to get to 1,500 pounds. The Liberty Bell weighs 2,000. Overall it was a fun little investigation for the kids and I. They were both excited to be sleuthing around, searching for clues, reporting the facts.